Pearl Izumi has a rigorous product development process to meet the high-quality and high-performance demands of the fast-growing sports apparel market. Louisville, Colo.-based Pearl Izumi is a cycling, running, and triathlon apparel and footwear company committed to crafting and delivering the best fitting, feeling, and functioning run/ride/tri performance products. The company’s goal is to provide its consumers with apparel that allows them to comfortably run or ride 365 days a year. According to teonline.com, performance apparel is defined as garments that perform or function for some purpose such as to help athletes and active people keep cool, comfortable and dry using moisture management and other techniques. Performance apparel is one of the fastest-growing sectors of the global textile industry. The growth of the performance apparel market can be attributed to lifestyle changes made by a majority of the population. As such, high-tech fabrics and apparel made for high performance are in demand. Clothing no longer represents just status and sophistication — functionality and performance count and clothing should be fit for a purpose. Pearl Izumi tested varying clothing designs and materials in a wind tunnel with its sponsored pro team, BMC, in preparation for the upcoming racing season. Material technology is essential for addressing the needs of Pearl Izumi’s consumers. Its design and development team works year round to build products that meet consumer expectations and anticipates their future needs. Because Pearl Izumi products are warrantied with a lifetime guarantee, the company’s materials and quality teams diligently work to validate the products. It has strict quality programs in place for both materials and garments, as well as a vigorous development testing process to confirm the fit and functionality of the performance products. 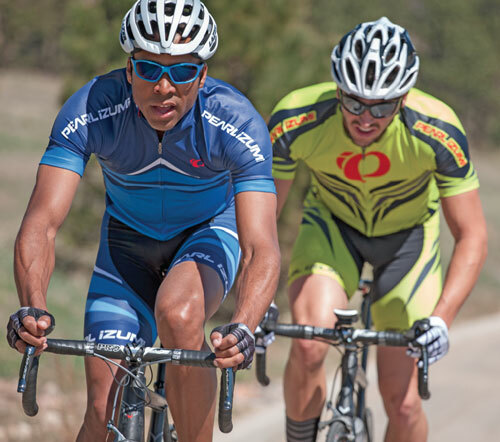 Pearl Izumi takes pride in providing high-quality products that deliver high-quality performance. The company uses technical materials that enhance the athlete’s experience. There are a number of different options for incorporating technology into an activewear garment, which include yarn technologies, material technologies, and construction technologies. Yarn choice is critical when initiating new fabric development. When working with mill partners, Pearl Izumi considers how the yarn selection will affect the stretch, look, and feel of the material. After the target aesthetic is determined, the development team then considers additional performance criteria that can be achieved with yarn selection. Advances in yarn development improve the material’s drying time, cooling properties, heating properties and water repellency. There also are yarns available that offer thermoreactive properties, which can aid in blood circulation and recovery after extensive activities. After the yarn requirements are confirmed, Pearl Izumi considers specific material properties. Fabrics are engineered to provide specific stretch and compression properties for the best garment fit. The comfort region for stretch lies between 20- and 40-percent elongation. Less than 20-percent stretch limits the range of motion. Proper stretch in the fabric improves the overall fit of the garment, and a proper fitting garment allows the athlete to focus on the workout, not the apparel. Pearl Izumi tests the stretch and recovery properties of all of its fabrics containing elastane to ensure consistency so that the garments fit the same year-after-year. Fabric construction can improve or reduce moisture transfer from one side of the fabric to the other. Athletes sweat in order to regulate body temperature. Perspiration increases rapidly with increasing skin temperature. The human body makes use of evaporative cooling by perspiration to give off energy and maintain thermal equilibrium. Innovation in materials and garment design help to regulate skin temperature and perspiration so that the body is able to continually perform. Pearl Izumi selects functional yarns that enhance wicking or the ability to move moisture from the surface of the skin through the fabric. Wicking yarns have a higher surface area created by the number of filaments or cross sections of the yarn. This increases the surface area throughout the fabric, which allows for faster drying. In addition to using functional yarns in its materials, Pearl Izumi considers two-layer fabric constructions that move moisture using an osmosis-like process. Moisture is pulled through the less absorbent layer against the body to the more absorbent surface of the garment for fast evaporation. Treatments and applications to the finished fabric provide weather protection in a variety of environments. Pearl Izumi selects materials that will protect the athlete in any weather condition without inhibiting comfort. The company works with its mill partners to engineer laminated materials that are waterproof, windproof, as well as breathable, so that the product breathes well during the intense effort on the uphill and protects an athlete from the wind and elements on the downhill. The company chooses the components of the laminated material based on the intended weather conditions for the activity. For cold and dry environments, water-resistant materials with an extremely breathable windproof coating and thermal backing are chosen. For wet conditions, the company focuses on seam-sealed garment construction and 100-percent waterproof materials with a durable water-repellent treatment. More and more athletes are concerned about their safety when out and about, and there are a number of new technologies, in addition to color selection, that ensure an athlete is seen. Color selection improves the visibility of the rider or runner so that they feel safer in poorly lit environments. For many years, Pearl Izumi’s screaming yellow colorway consistently has been the most popular outerwear color choice. Advances in textile visibility include reflective, luminescent, and glow in the dark yarns, membranes, and prints. Some luminescent technologies are activated by headlights. Pearl Izumi tests all of its reflective elements to ensure they meet a specific candlepower and luminous intensity requirement to ensure the rider or runner can be seen from 100 meters away. Pearl Izumi is the sponsor of the BMC pro cycling team. In events like the Tour de France, cyclists’ speed and efficiency are critical. Therefore, the company designs products to be aerodynamic. Like the dimples on a golf ball designed to help it soar further, texture on the surface of a material can improve its aerodynamic properties for a cyclist. Reducing the total amount of drag and resistance on the bike will allow the athlete to put forth less effort to go faster. 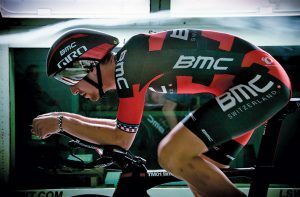 In a solo event or triathlon, lowering total aerodynamic drag by 10 percent — from 7 pounds (lbs) of drag to 6.3 lbs — without changing power output, will cut 21 minutes of time, or 7 percent, from a rider who averages 20 miles per hour over 100 miles. Total time will drop from 5 hours to 4 hours and 39 minutes, and average speed will go up to 21.4 miles per hour. Sustainability continues to play a role Pearl Izumi’s material and vendor selection. This is an initiative undertaken by most of the outdoor and active apparel industry. Multiple organizations such as the Outdoor Industry Association (OIA) and Sustainable Apparel Coalition (SAC) are addressing compliance and transparency in the manufacturing processes. According to the SAC, the Higg Index — a groundbreaking suite of self-assessment tools that empowers brands, retailers and facilities of all sizes, at every stage in their sustainability journey, to measure their environmental and social and labor impacts and identify areas for improvement — is its core driver. “Higg delivers a holistic overview of the sustainability performance of a product or company — a big-picture perspective that is essential for progress to be made,” reports SAC. There are multiple choices that apparel companies can make in order to be more sustainable. Options include using bioderived or recycled yarns, and lighter and more efficient fabrics. Many companies regulate the chemicals used to finish materials. These include fluorocarbon-free water-repellent finishes and more efficient dyeing processes. The textile industry is second only to the agriculture industry as the largest polluter of drinking water. Many large brands now are using dyeing methods that use less water or even no water at all. In addition, more brands are looking at using anti-odor yarns and finishes to further reduce water usage by reducing the number of times the garment needs to be washed. Brands also are reducing packaging to reduce waste. Carlsbad, Calif.-based activewear company PrAna has eliminated 31,000 pounds of waste by reducing the size of its poly shipping bags. Pearl Izumi and many active and performance brands continually are looking at new technologies to improve products. Editor’s Note: Carol Little is senior materials manager at Pearl Izumi. This article is based on Little’s presentation given at the 2015 Textile World Innovation Forum.